A continuing look at a few of the slimlines and their friends. Slimline in secupira. 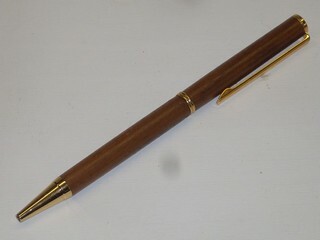 I got a piece of this in Halifax from a shops cut off bin and it made some nice pens. 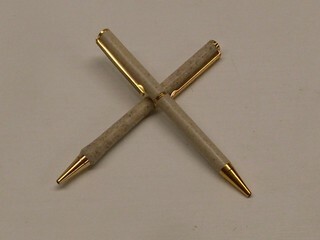 I was at a local supplier of counter tops made in a material similar to Corian™ and got a couple of pieces of scrap from them, enough for several pens. These were made from the material as a thank you. Another slimline in secupira. This wood does not have a lot of grain and I am supprised how popular it has been for me. 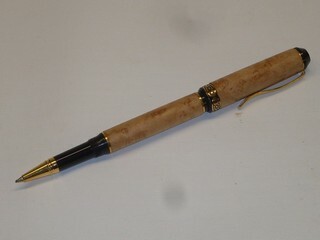 For a different look at pens and possiblilities, this is a rollerball turned from figured, bird's eye' maple. 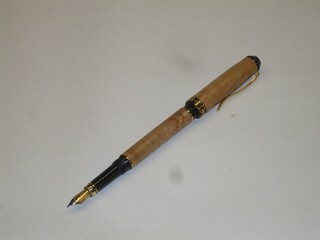 There is a greater set of skills needed for turning these pens but after a few slimlines, it is certainly attainable. 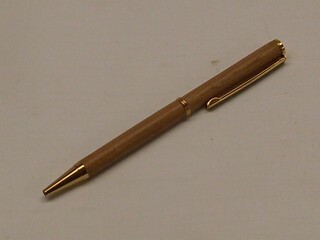 This figured, bird's eye maple fountain pen is turned from the sister kit to the roller ball. It is one of my favorites. 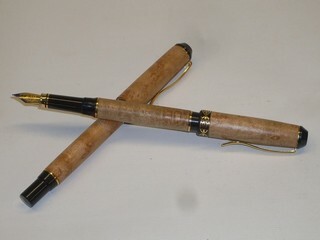 The two figured, bird's eye maple roller ball and fountain pens together make a nice couple.